UMX Quick Release and Triple Safety Snap-On Lanyards- 3/4" Snap-On Safety Lanyards With Three Safety Breakaway Protection. 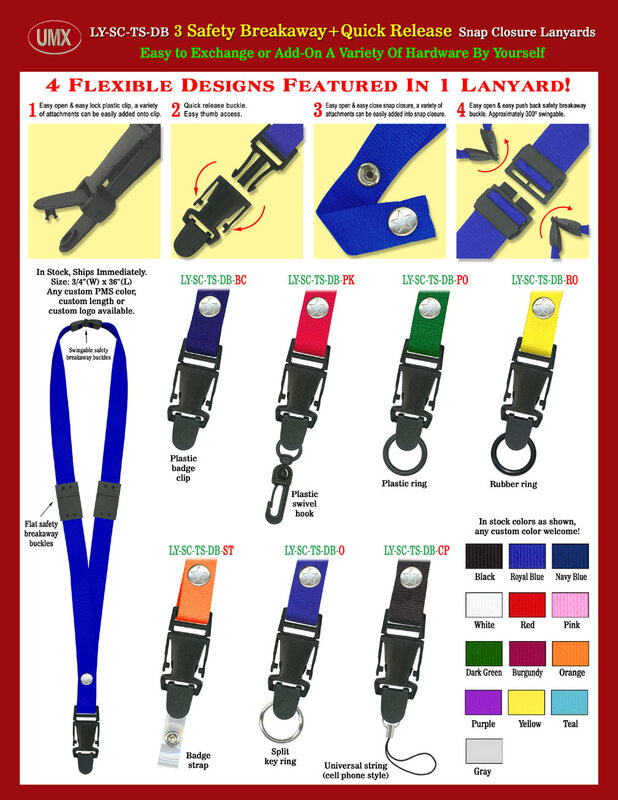 The 3/4" wide by 36" long heavy duty quick release and triple safety breakaway snap closure lanyards come with 13 colors available, black, royal blue, navy blue, red, dark green, orange, yellow, pink, gray, purple, burgundy and teal colors. There are 6-locations can be easily released and closed . This lanyard, you got 4 flexible designs featured in 1 lanyard! Great lanyards for those working at hospital, jail, police department or mission critical environment! Simple, Flexible, Quick Release and With Multiple Safety Protection! You are viewing Lanyards > Snap Closure > Quick Release and Triple Safety Snap-On Lanyards- 3/4" Snap-On Safety Lanyards With Three Safety Breakaway Protection.